Agile collaboration for Architecture & Construction. Bricks is an online collaboration app designed by architects to reinvent Architecture design and BIM with an Agile approach..
Agile methods like Scrum, Kanban or Scrumban are used by thousand of companies and startups around the world and revolutionized the way to build software. The good news is that they can be used in architecture and construction too and integrated in your BIM workflow! Discuss the project in an online workspace. Get project history in one place and reduce email noise. Follow the progression in a visual way from To Do to Done. Prioritize and follow advancement. Manage many topics on a table. Like the excel sheets but more powerful. Create teams to share only with the people you need and make the discussion more efficient. Track progression from sprint to sprint. Get a global view of the status of the work. Organize your work in short iterations. Motivate your teams and adopt an agile organization. Create tasks to list the work to be done. Estimate task complexity to evaluate what can be done. Set which comment is the best response to a discussion. Easily find what is the last decision. Import BCF files from other BIM software. Import many issues with screenshots easily. 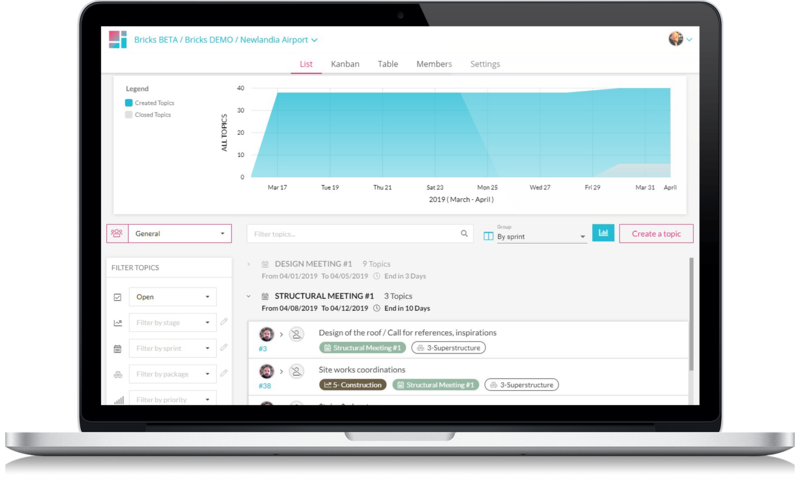 Consolidate the project discussion in a shared workspace where you can share the same level of information with all team members. Clarify the discussion, reduce emails clutter and save time for a better project design. Join Bricks beta and help us build the dream collaborative platform for Architecture & Construction. Let's adopt Agile BIM and revolutionize the way we design architecture thanks to agile collaboration.